Explore a daring and intense multi-blend collection. Our South American blends showcase distinct personality with hints of Indian Robusta. Our high-quality beans take on the lively characteristics that harness the Latin love of life and family. Explore bold textures, flavors and richness that exemplify the inspiring diversity of the Latin culture. Our specialty-grade options fit in with your luxury lifestyle and exceptional palette. Every flavor is crafted via luxury traditions with your lifestyle in mind. 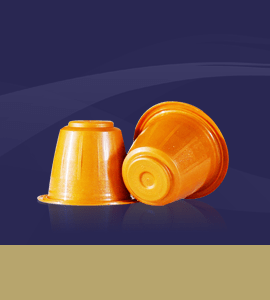 Enjoy the convenience of our espresso capsules which work in Nespresso Origina line Machines. Without sacrificing quality or the bold flavor you crave. Our Coffee Beans in the Signature Collection are carefully grown and hand picked from small farms in South and Central America. Then blended with Indian Robusta beans to enhance flavor and create body and balance. 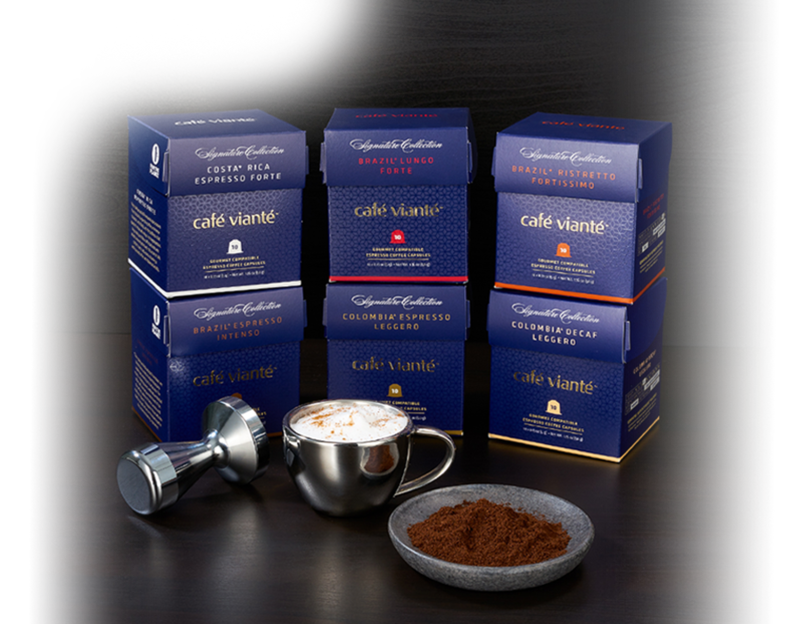 Only a small percentage of the world’s coffee production meets the quality requirements of Café Vianté. Our coffee roasting process follows an old Italian artisan method. We pack our coffee in capsules right after to assure maximum freshness. The result: the best single serve espresso shot in your cup. A truly gourmet coffee experience. What is in the blend? This darkly roasted coffee is a blend of high grown Brazilian Arabica beans which is expertly blended with a hint of hand selected Indonesian beans to create a strong Italian style taste with an intense dark chocolate and molasses aftertaste. Explore bold textures, flavors and richness that exemplify the inspiring diversity of the Latin culture. Hand-selected Arabica beans from Brazil are blended with the best beans from Africa to create a full-body and intense coffee that is rich in taste, aroma and acidity. 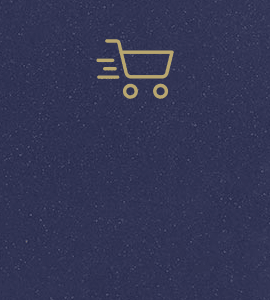 Complex characteristics and a full range of properties. Explore a daring and intense multi-blend collection. This blend uses Arabica beans from Brazil blended with a hint of Indian Robusta to awaken and intensify its lively taste. 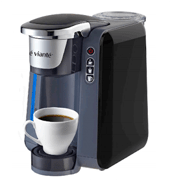 The result is a slightly sweet and medium-bodied coffee with a velvety smooth finish. 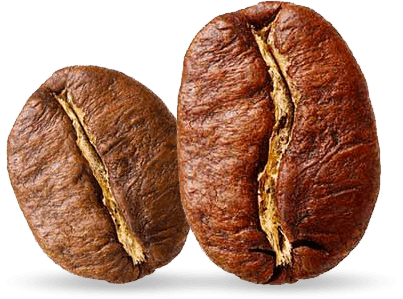 It has the perfect balance of taste, aroma and acidity so it doesn’t disappoint those who like darkly roasted coffees or those who prefer a less intense drinking experience. Explore bold textures, flavors and richness that exemplify the inspiring diversity of the Latin culture. These darkly roasted premium Arabica beans from Costa Rica give this coffee and intense character, a full body, and the boldness that appeals to those who enjoy a strong espresso. Very small quantities of African beans are added to intensify the lively character of this coffee’s taste and aroma, creating a well-rounded coffee with balanced acidity. Explore a daring and intense multi-blend collection. Consisting of the finest Arabica beans from Colombia, blended with quality Arabica beans from Costa Rica and a hint of India Robusta to enhance taste and create balance. 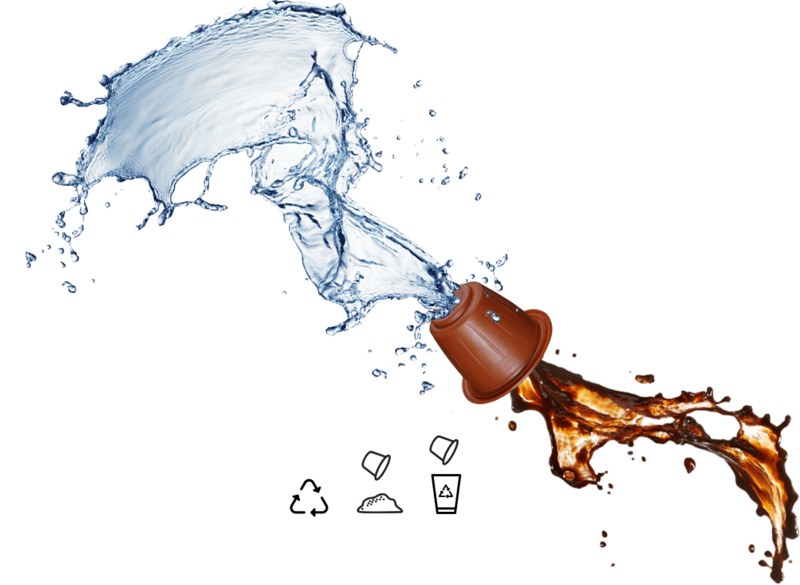 A mild and easy-to-drink espresso that has a fruity flavor with a softly rounded character. 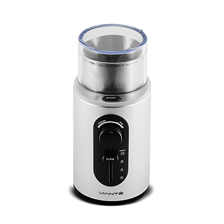 Ideal for those who can who can enjoy a good cup of bold Italian espresso but prefer a lighter, less intrusive taste. Explore bold textures, flavors and richness that exemplify the inspiring diversity of the Latin culture. The delicate roast preserves the full body of these premium decaffeinated Colombian Arabica beans, bringing out a subtle charred flavor with a hint of Oak. Rich bright aroma. Mild acidity with medium to high body. Complex flavours of fruits and floral notes. Slightly creamy with some sweetness and hints of dark chocolate in the after-taste. The Nespresso Compatible Signature Collection Variety Pack is a perfect way to satisfy the tastes of all coffee lovers. Espresso Leggero, Brasil Lungo Espresso Forte, Colombia Espresso Leggero Decaf, Ristretto Espresso Fortissimo. We designed our capsules to consistently deliver the best espresso performance possible. 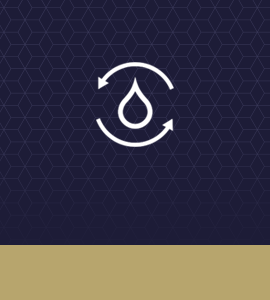 Our capsule technology allows us to fully control the espresso brewing process by allowing the right amount of water and flow rate for the perfect extraction of taste and aroma. Giving our coffees the adequate body, intensity and the rich crema that are so important for a gourmet espresso experience. Our proprietary Compatible Capsule Technology has been designed to work in Nespresso machines that use OriginaLine Nespresso capsules. 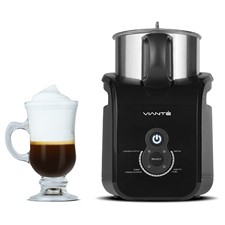 (Not Vertuoline Systems) and all other coffee machines compatible with the same Nespresso System. 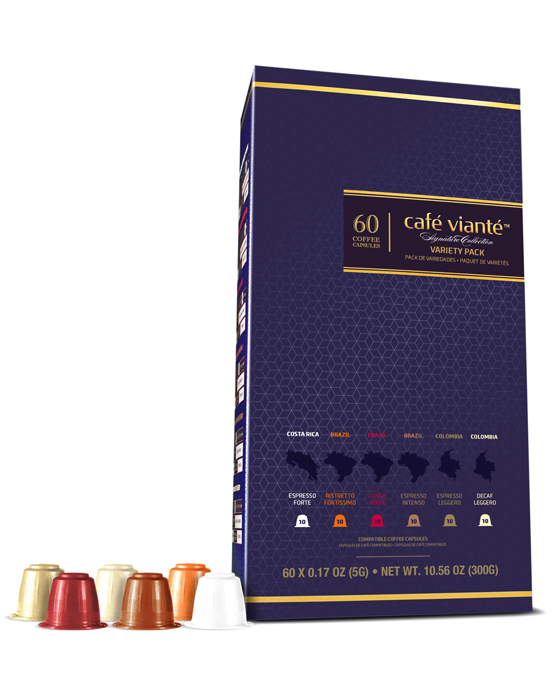 CaféVianté is not affiliated or endorsed by Nespresso.